My practice of translating poetry is more than just a decoding of what someone wrote in a tongue not my own. It’s the unlocking of thoughts, the unveiling of sights, and the unmuting of sounds that I would otherwise never imagine. These discoveries facilitate word-play and poetic insight as I interact with my Anglophone world. On the same trip, I began researching Québécois snow-poems to translate. One of the books I picked up was Claude Beausoleil’s MÉMOIRE DE NEIGE. As everyone else slept-in after our long drive home, I started reading the book’s first poem “Tempête.” And there it was on the second page: l’effet de givre submergé. I’d never seen the word givre before. Wary from past experience with false cognates, I did a quick search in my French dictionary app. Et voilà: frost — the effect of flooded frost. Frost/givre. Ungive/thaw. Robert Macfarlane’s thoughts on the derivation of ungive for thaw are poetic, but I wonder if the Norman conquest and its effects on the English language also play a part. I don’t really want a definitive answer because the fun is in wondering; I only have this kind of fun because I translate. And now, because of translation, I’ll wonder all the more every time the givre on my window ungives at sunrise. Learned a new French word today while translating AVEC TES MOTS by Angèle Bassolé-Ouedraogo. 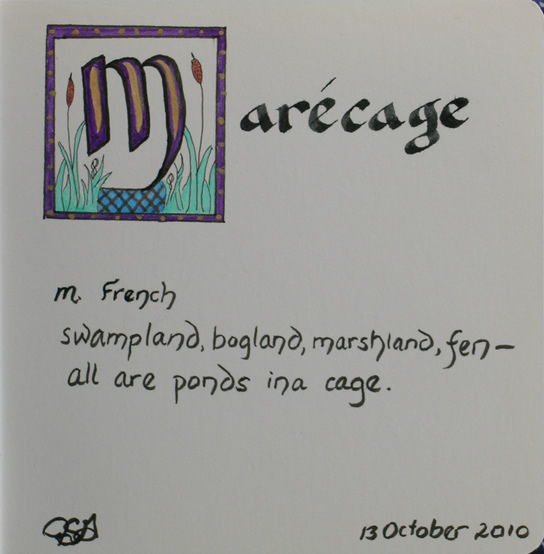 I found it intriguing that the feminine pond became a masculine swamp when imprisoned in a cage of silt and roots.